Join us for a detailed look at questions asked by members of the Business-Software.com Community. Today’s question comes from S.G., who asks, “How do you rank Taleo and SuccessFactors for their performance management tools? Is there other performance software you would recommend?” Performance management is a core component of any talent management suite. Talent management solutions provide organizations with tools and structures to effectively manage the employee lifecycle, from recruiting to onboarding, learning and development, compensation management, career development and succession planning. Performance management specifically aims to create an environment where the entire performance evaluation process is efficient and transparent, where goals and expectations are measurable and well-articulated, and where feedback is clear and relevant. Done right, employee reviews can be valuable conversations where managers and employees work together to become more effective members of the organization. If the process lacks clarity, structure, and transparency, reviews can be a great source of angst and confusion. This disparity underlines the value of solid performance management capabilities. A few of the top players in the talent management segment, with quality offerings in the area of performance management are SumTotal Systems, Kenexa and Peoplefluent. But the most logical comparison among the players in this space is that of Taleo and SuccessFactors. Both are Bay Area companies that offer robust cloud-based talent management solutions, and both were recently acquired by competing global software giants. SAP bought SuccessFactors for $3.4B in December 2011 and Oracle picked up Taleo for $1.9B earlier in 2012. 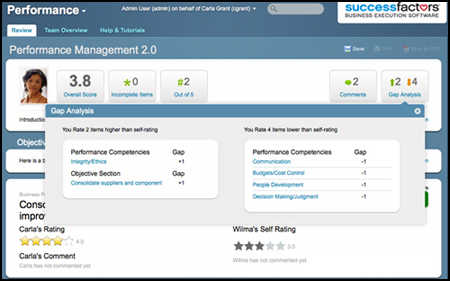 SuccessFactors knows performance management. The company was founded by Lars Dalgaard in 2001, and it specialized in performance management up until 2009 when the company announced a shift in strategy toward a broader talent management solution via its business execution (BizX) suite. Taleo’s trajectory was slightly different. The company started by developing recruiting applications under the name Recruitsoft in the late ’90s. It changed its name to Taleo in 2004 and later added products and capabilities to meet the growing the demand for talent management solutions. It added a performance management module in 2008. Whereas Taleo offers its solutions in a more traditional “talent management” package, SuccessFactors positions its products as a “business execution” suite by coupling essential HR features with workforce analytics, collaboration and mobile functionality. The BizX concept is a clear attempt by SuccessFactors to position its products outside the competitive talent management segment, but for most buyers the extra functionality won’t be a deciding factor in their software search. Perhaps one of the biggest distinctions is that SuccessFactors integrates goal management into its performance management solution, whereas Taleo treats goals as a separate module. The SuccessFactors goal feature helps organizations align employee goals and manage these goals over time, strengthen accountability, and improve employee engagement. 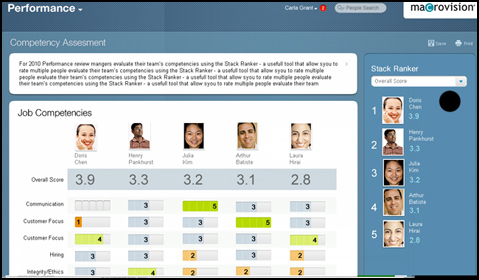 Its performance review features are designed around offering on-demand insight into employee performance. 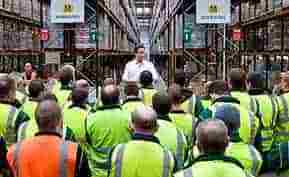 Reviews themselves become less of an interrogation and more of a dynamic exchange of feedback between managers and their team-members. The “360 Reviews” bring multiple perspectives into assessments to create a full picture of employee performance. The system is also designed to streamline the review process to save time and resources. The defining features of Taleo’s performance management module are its talent browser, which employs visual search to locate talent within an organization; its conversation hub, which enables managers to gain a view of all conversations they’ve had about their employees; extensively customizable review templates; and writing assistant tools that aid managers in creating well-written, consistent reviews. Additional modules offered by SuccessFactors are a team rater feature for easily assessing/ranking team members across report criteria, a calibration feature for ensuring that reviews are based on objective criteria–both of which are features supplied by Taleo. Both SuccessFactors and Taleo offer small business and enterprise editions of their software. There is a significant amount of overlapping functionality in these two solutions. In the end the decision should rest on what product you feel most comfortable with. Short of calling up a salesperson and requesting a demo, your next best option is video. To get a feel for how Taleo’s solutions look, watch this video from that shows a walkthrough of Taleo Enterprise. SuccessFactors offers a peppy video overview of the company’s performance and goals module that will give you some sense of how the UI looks. Compare all the key features, pricing options and deployment methods of SuccessFactors, Taleo and other top talent management solutions side by side in our newly redesigned Top 10 Talent Management Software report.